Canyoning (which is also referred to as ‘canyoneering’) is an exciting outdoor activity that allows you to experience the great outdoors whilst submitting yourself to a number of challenges which can include climbing, abseiling, swimming, jumping off cliffs and scrambling. It can be as easy or as difficult as you want to make it but as with any activity of this kind, it can be dangerous so it’s important that you consider your safety. Unlike traditional climbing where you’re likely to be wearing climbing boots, to stay safe when out canyoning, one of the main considerations when it comes to safety is to wear the correct footwear. Descending gorges and jumping into water means that not only is your footwear likely to get wet but you’re going to encounter terrain which, because parts of it are likely to be wet, means that it’s going to be slippery. Rock will be covered with moss, algae, mud and lichen so heavy boots are not likely to be suitable with such slippery and greasy surfaces around. You should buy yourself a pair of suitable canyoning shoes. These will make it easier to maintain your footholds and increase your safety. Additionally, you should wear a safety helmet for obvious reasons and a wetsuit. The latter will not only protect you from any freezing cold water you encounter but will also help to protect you from any sharp, jagged rocks. Depending on the terrain and level of difficulty, you might also need to take ropes, harnesses and descenders. You should be fine with any climbing harness that’s in good condition but you might be better off buying a specialised canyoning harness which is made of additional abrasion tape and they also come with a higher clip-in point which means they tend to be more convenient and comfortable if you’re doing multiple abseils and it will increase your safety. Most standard descenders are fine but it’s better to choose one which is designed to be clipped and unclipped from a rope without the need to remove it from the harness. The main reason for this being that when your hands are cold and wet, if it’s not clipped to the harness, there’s every chance that you might fumble it and it’ll drop into any deep water below. Many people have suffered serious injuries and some have died as a result of jumping into pools before checking that it’s safe to do so. 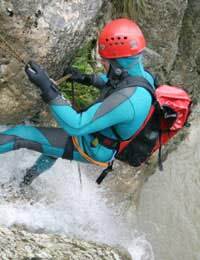 Obviously, if your canyoning experience is run by a specialist outdoor activity centre, it’s should be reasonable to assume that if the instructor tells you it’s safe to jump into a pool, then go ahead. However, if you’re going it alone, it’s always preferable to abseil down than to jump into a pool from a great height unless you know what you’re dealing with. Many ‘inviting’ pools hide the fact that there are often unseen boulders lurking just beneath the surface of the water which, obviously, could prove fatal if you were to land on top of them. Equally, there may be overhangs of rocks or tree branches which you can’t see from the summit of where you’re intending to jump from. So, never jump into a pool unless you’ve done a completely scan of the area and are sure of your landing. Don’t overlook any tidal currents at the bottom either. Other things to watch out for include the possibility of flash floods. Certain gorges can flood very quickly if there’s a sudden prolonged downpour and also give yourself plenty of time to descend. Abseiling and getting out of a gorge can be very dangerous if you’ve not calculated the time it will take you to do so and it ends up getting dark so don’t over commit yourself. Also familiarise with your equipment and learn how to react if your ropes or descenders get jammed. If you’re just starting out in canyoning, one of the best ways to stay safe is to go on an organised outing through a specialist outdoor activity company. This way, you’re able to familiarise yourself with what’s involved under the supervision of qualified instructors which will add to your safety.